I equate it to the New Yorker, which may not cover the exact subject matter that you or I might be interested in, but even so you can’t ignore its stories because they are so compelling and good. You may not be interested in commercial fishing, or digging sea worms for bait, but you’ll want to read stories about these subjects when you see them in AJ. The writing is complemented by really fine photography. 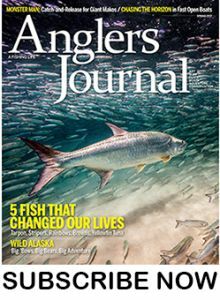 I would rank Angler’s Journal among the very short list of magazines I would subscribe to these days. If you haven’t seen the mag, do yourself a favor and buy a copy or, better yet, subscribe. My first piece in the AJ came out earlier this year and covered my commercial fishing days in Alaska, which led right into my passion for swinging kings and steel with tw0-hand rods. Following is a video that AJ Editor-in-Chief Bill Sisson sent my way. I’ll share it with you here because it’s good, and it’s provided with authenticity from a guy who’s the real deal, meaning he’s spent his life with a singular purpose—pursing fish. And that isn’t about to change anytime soon. This entry was posted in Culture, Industry and tagged Angler's Journal magazine, best fly fishing magazines, Catching giant fish. Bookmark the permalink.